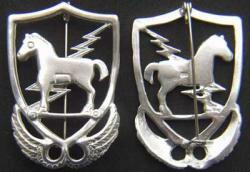 10th Special Forces Group – The first DI made for the 10th SF was made by a jeweler in Germany when the group first deployed in the 1950’s. This is an exact museum quality reproduction of that badge in sterling silver and is now being worn by current members of the 10th in the combat zone. We are the ones making the badge for the brave men of the 10th. Original of this badge are extremely rare.